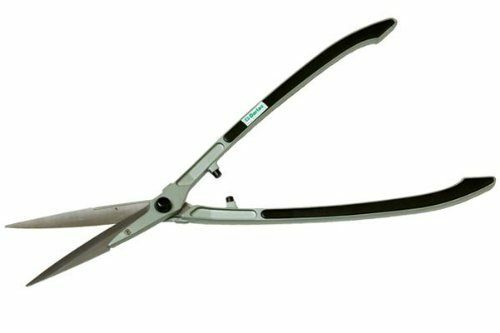 In this article we look at the top rated hand or manual garden shears that can be used to cut grass or hedges. There are plenty of these to pick from in the UK market. Here we look at that we believe to be the best, according to our summaries of actual buyer reviews. We hope that you find this helpful, as it should help you cut down on research time. If you are looking for a set of shears that are a little cheaper, then these are considered to be a good budget set. These are light in weight, compact and the blades are very sharp according to buyers. Dralac is one of the superior gardening brands. Their shears and other garden tools do cost a little more, but they are known for their high quality. These are long handled shears, that are light in weight, and very comfortable to use. The blades are very sharp, and also easy to sharpen, and are coated with carbon steel to prevent any worries of rusting. 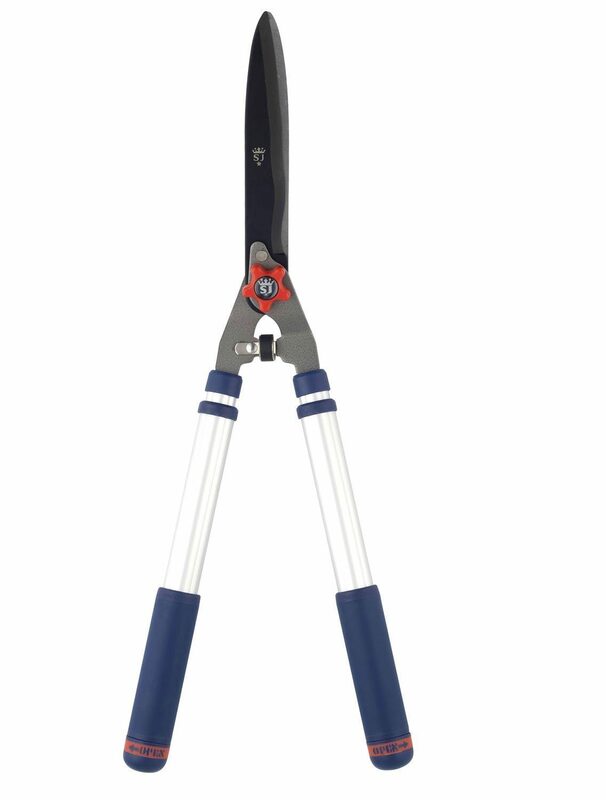 If you have a high hedge, or indeed a wide hedge, then a set of telescopic shears, will be a very good choice for you. As the name would suggest these extend, and that allows you to reach a longer distance. These shears have an average cost of £25 depending on where you make your purchase. They are from the excellent Spear & Jackson brand. Some excellent features on these including the lightweight aluminium handles, soft feel grips and shock absorbers that help prevent wrist jarring. The blades are made from carbon steel and coated with PTFE. They come with a 10-year guarantee. These shears cost around £35-45 so certainly not a cheap option. These are geared shears and that does make cutting a great deal easier. They have stainless steel blades which have been coated with PTFE, which helps reduce friction. The gears increase the power of a stroke from 1 to 3, so really useful. We have put together a handy buying guide that covers off the most important features of what to look for when it comes to buying hand shears. Above I have shown what I believe to be the best hand shears on the UK market.​ The key to buying a good set of shears, is the blades. For effective and efficient hedge or grass cutting, the one thing you need is very sharp blades. Ideally they should be made from either carbon, or stainless steel. The blades should also be coated with something like PTFE. That helps reduce friction when cutting, and also helps prevent the blades from rusting. It can also cause the muscles in the arms, legs and the back to get tired and start to ache. In the longer term, that can lead to all sorts of medical problems.​ The older shears used to be made of wood, with heavy metal blades. That made them difficult to grip, and they were also pretty heavy. If you have higher hedges, or wide hedges, it is worthwhile considering a telescopic option. Typically having that feature, will give you an additional 6" of cutting length. Now I know that does not sound like a lot, but it can make a huge difference. 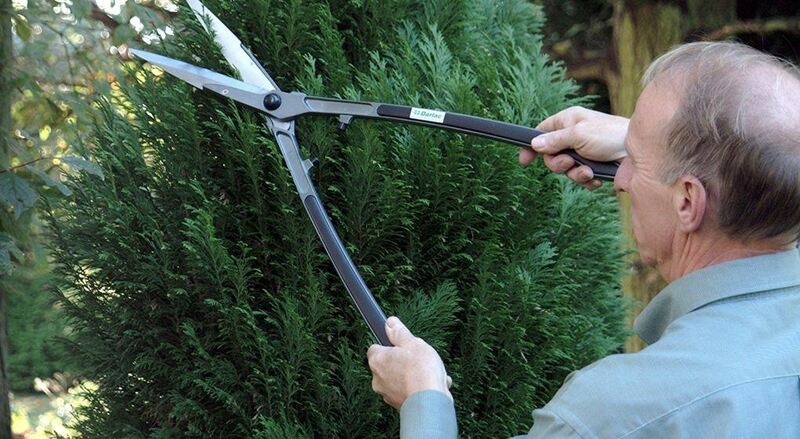 Below you will find a great video on how to get the best use from your hedge shears. If you buy a good quality set of garden shears, they really can last you for a lifetime. Most shears will easily last you for 3-5 years, even if you don't look after them that much. However, with just a little love and care, they can last a great deal longer. 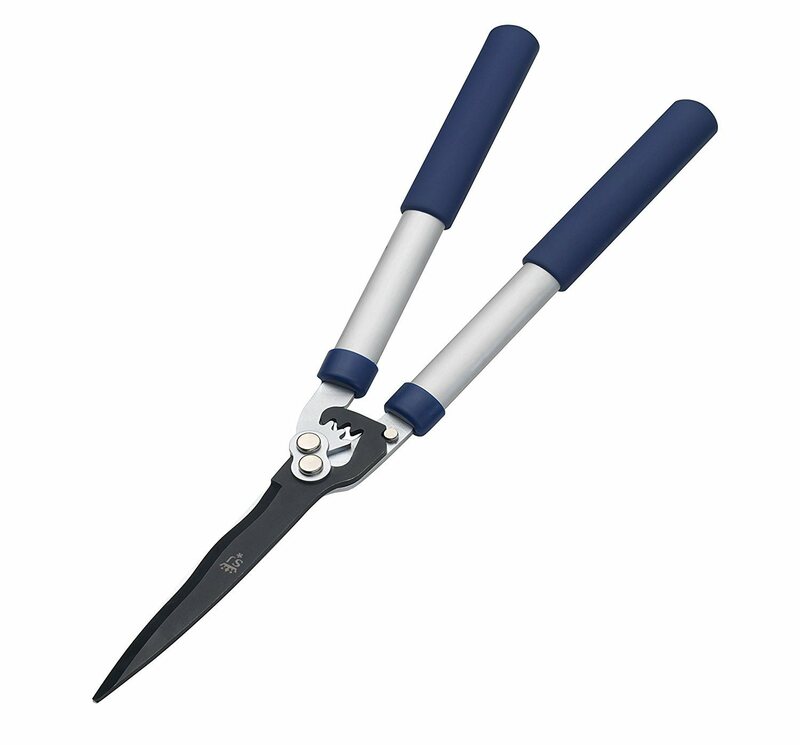 Here are some very simple tips to add years of life to your garden shears. A simple wipe with a cloth will remove sticky sap from your blades. Most blades are designed to be rust free. However they can stick quite easily. A simple wipe with a cloth can remove any hedge or grass sap, and that keeps the blades gliding very easily. A little 3-in 1 oil will go a very long way to keeping your clippers in great condition. Normally I place a little oil around the centre nut, and then move the clippers in and out, allowing the oil to get right inside the tightening nut. When that is done, I add a tiny amount of oil to a cloth, and simple wipe that over the blades. That will keep everything running smoothly and ready for their next outing. The two simple tips above take less than one minute, but will add years to the life of your hand clippers. Again many of these products have self sharpening blades. If they do that is good​ and save you the trouble of having to sharpen them. If you have to do it yourself, then I would recommend sharpening about once a year. You can either learn how to do this yourself, or leave them in with a professional and get it done right. Avoid trying to cut really thick twigs​ or small branches with your good hedge clippers. Pruners or loppers are best for that. Your normal hedge clippers are not designed for heavy work of that nature.